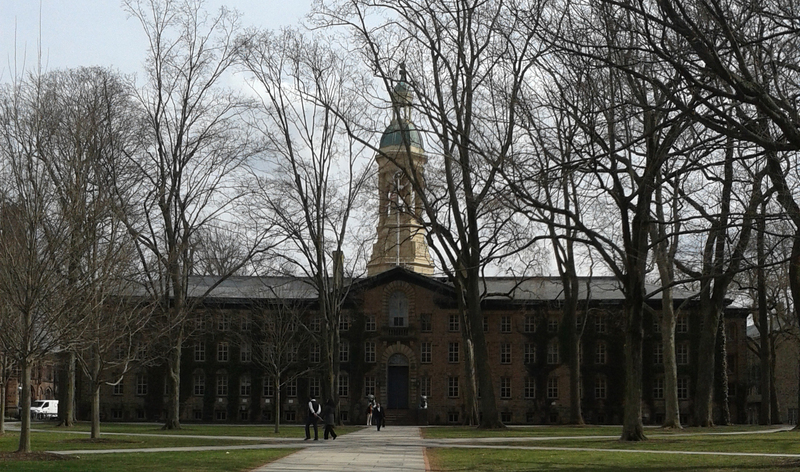 Our trip to America with the Baberoo began with 36 hours in New York, then continued on to Princeton, NJ. We left Oxford Daddy there for the week while he did his archival research, and the Baberoo and I took a train trip to Washington DC to visit my sister. I had never been to Washington before but I had heard good things about both its baby-friendliness and its amazing sightseeing opportunities. And of course, it was great to see my sister and also to be able to sleep and eat in a real house instead of being in a hotel and restaurants all the time. Hands down, Washington DC wins the baby-friendliness award when it comes to transport. The Metro, its underground/subway system, is fully accessible to all strollers (and wheelchairs), with elevators at every single station so that you can get from street level to platform without folding your buggy, even if it’s a huge one or a double stroller. Are you listening, other cities? Every. Single. Station! Just look for the elevator entrance on the street (a dark brown structure with a big M) and you’re on your way down to start your journey. Sometimes it’s a little complicated, with a few elevator changes before you reach your chosen platform, but most of the time it’s straightforward and easy to use. The signposting is also very good and the fares are quite reasonable – most of the time they were $1.70 or so, depending on the time of day and distance travelled. There’s even a section on the Metro website that gives you elevator and escalator status, updated 24 hours a day, so you can see if there are any outages before you travel. With such a great transport system, I nearly didn’t try any other ways of getting around, but for the sake of thoroughness I decided I better check out the city bus and the taxi service. The city bus requires you to fold up your stroller – which I didn’t know before I attempted to get on, but it does say so right on the door of the bus. So I folded up, but it would have been an easier journey if I’d taken the Metro instead. Unless you’re travelling light and can fold your stroller easily, go for the Metro rather than the bus. Taxis were fine, and not very expensive. It was easy enough to hail one from the street, although by mistake we got one that had been pre-booked by someone else! One note about being in a taxi or walking on the street: drivers in DC are completely nuts and will drive into the intersection even though they have a red light. Be very careful when crossing the street. 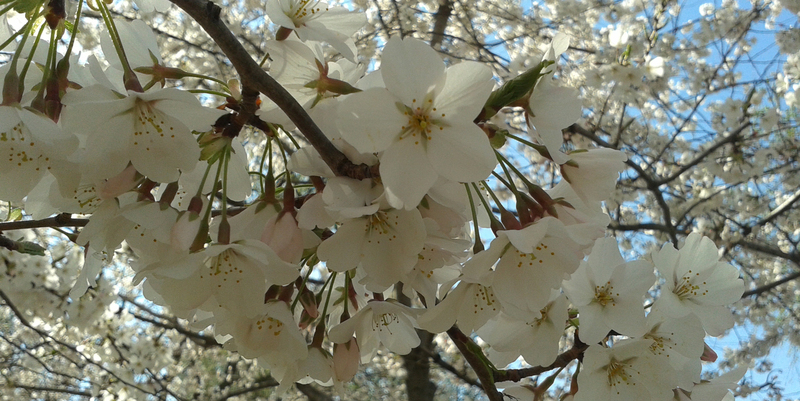 Washington DC is a very pretty city, especially in April, when the cherry blossoms are out. We were lucky and picked the exact week when the blossoms were most on show, and we also lucked out with temperatures soaring as high as 26 degrees. It was so beautiful and sunny that everyone seemed in a good mood and the sense of fun was heightened. We decided to take a walk to see the cherry blossoms along the Tidal Basin, part of the National Mall and Memorial Parks. It was gorgeous, but there were so many people walking along the same path that it was also really crowded and slow. Lack of sunscreen and pretty hot weather made us turn around before we even got to the Jefferson Memorial – but we enjoyed the short walk anyway. We took refuge in the National Museum of American History, one of the many Smithsonian museums (all free). Our exhibit of choice was the First Ladies, which was an amazing look at the contributions made (and the dresses worn!) by Presidents’ wives from Martha Washington onwards. As a fashion lover I found it fascinating, and the Baberoo seemed to like it too – although, as one of the museum docents pointed out when we asked, there is really nothing for under-5s at the museum. The museum has two Family Rest Rooms where you can change your baby. We didn’t manage to make it to any of the other Smithsonian museums, but if you are planning a visit, especially if you plan to stay all day and see many of the museums, your first stop should be the Smithsonian Visitor Center, in the Castle, which is open 1.5 hours earlier than all the museums so you can plan your day. 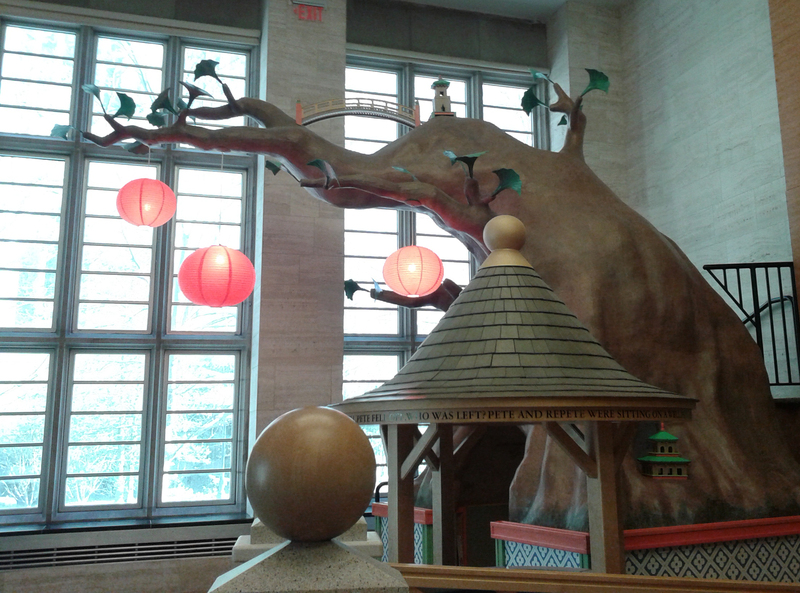 The Smithsonian is great for children and families, but the Baberoo is still too young to enjoy most of it. 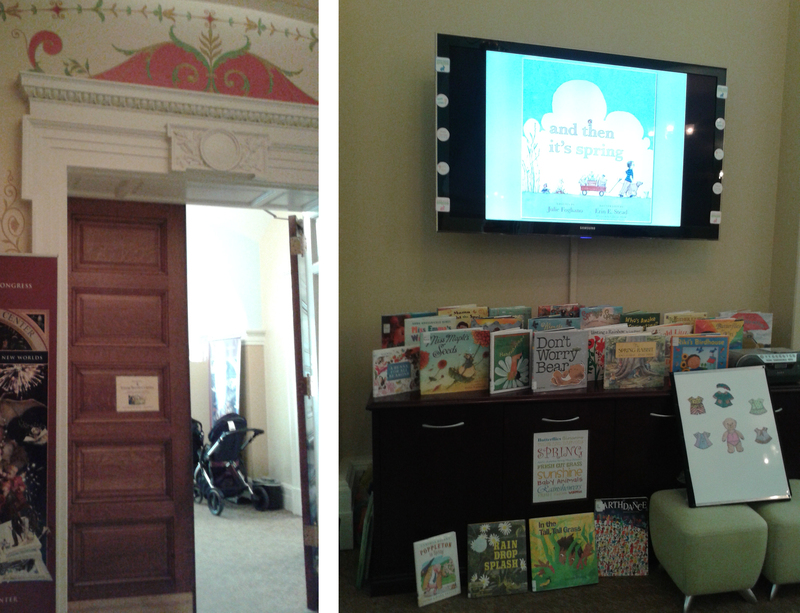 We did find a very baby-friendly activity, however, in the form of Story Time… at the Library of Congress! I was so excited to find that the Library has programmes for even the youngest of audiences. The free Story Time for Infants and Toddlers takes place every Friday (except holidays) at 10:30 am. Roll up early, because they only have 50 places (including adults) and they hand out numbered admission stickers on a first-come, first-served basis starting at 10 am. If you are there early and have got your stickers, you can browse the collection of children’s books and play with the toys in the Young Readers Center. The Jefferson Building, where the Young Readers Center is located, requires everyone entering to go through the security system, so leave time for that, especially since you’ll have to put your baby and your stroller through the metal detector separately. Storytime is a fun half-hour with sing-alongs and some books read aloud by the librarian. You get a handout with the words to the songs, so you’ll always know what’s coming up – the theme the day we were there was Springtime. The room was a little warm on the day we went, so the Baberoo got a bit hot and bothered, but she enjoyed most of the experience and if we lived there I’d be first in line every week for this lovely event. We mainly took a much-needed break from eating out while we were in Washington – I do love going out to eat, but not twice a day every day for a week! – so we only went to one restaurant. But it was probably my favourite meal of our entire trip to America. We ate an early dinner at Founding Farmers, a restaurant showcasing American cuisine (and owned by a collective of American farmers) in eco-friendly settings. I ordered the Skillet Corn bread ($5) to share with the Baberoo as a starter, and we were presented with a huge cast-iron pan full of the lightest, fluffiest cornbread I have ever had. It came with whipped butter in a pool of honey, with sea salt on top. What a revelation! It was so good that the Baberoo, a big fan of corn and anything corn-based, wolfed it right down, although it was such a big portion that you could actually order it as your meal and not be hungry afterwards. 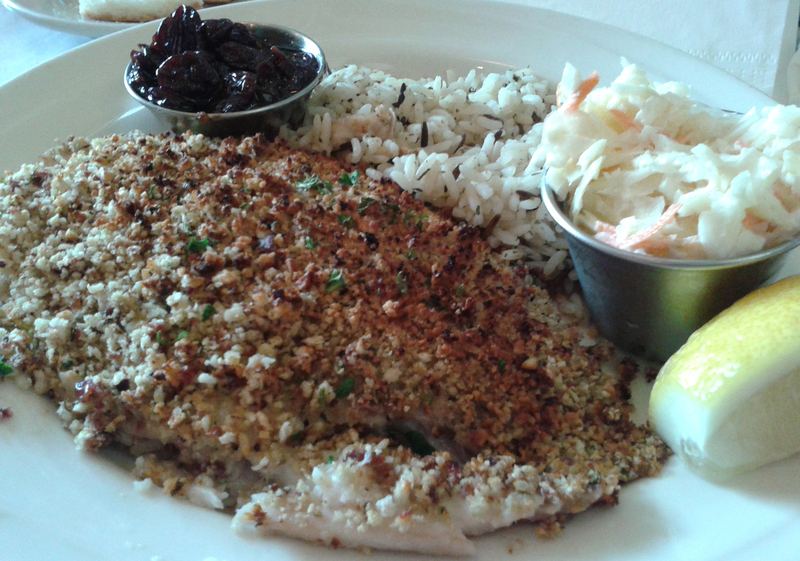 Luckily, I had ordered us a main to share as well, and it was equally good. The Founding Farmers take on Macaroni and Cheese ($14) includes Gouda, Gruyère, ham, peas, and apples, and is a very sophisticated dish for such a comfort-food favourite. We both loved it, and there was enough left to take home and eat for breakfast the next day. 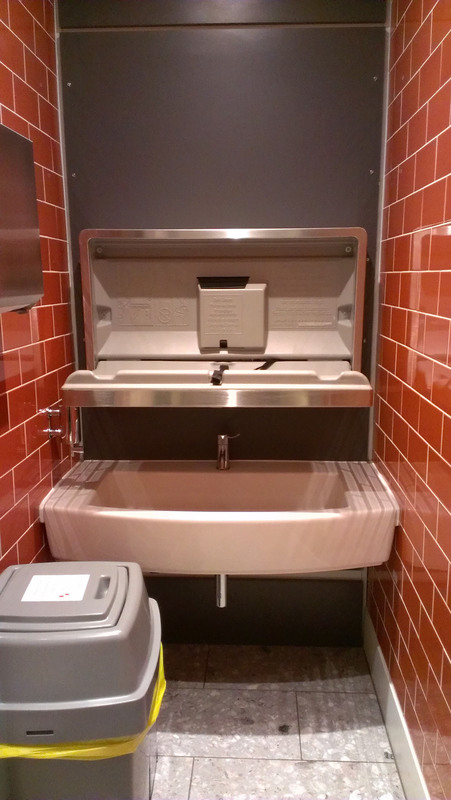 The only strike against Founding Farmers is the lack of baby-changing facilities in its bathrooms, which is a shame because they could easily modify the disabled bathroom to include a changing table. Still, they do cater well for babies with good booster seats (that strap onto a regular dining chair) made by Stokke, so I felt that the Baberoo was comfortable and secure while she was eating – more so than with your standard restaurant high chair. Note: the restaurant books up well ahead, so make a reservation! We had a wonderful time in Washington DC, and it was very easy to get around thanks to the brilliant Metro system. There were some opportunities for baby-friendly activities, and I am looking forward to going back sometime when the Baberoo is older so we can really appreciate the museums together. For now, I’m just happy to be back home in good old Oxford, so we can resume our regular schedule of testing the city’s offerings for baby-friendliness. New York has been one of my favourite cities for a long time, and I was extremely excited to have the opportunity to pass through for a weekend on our way to Princeton, NJ. 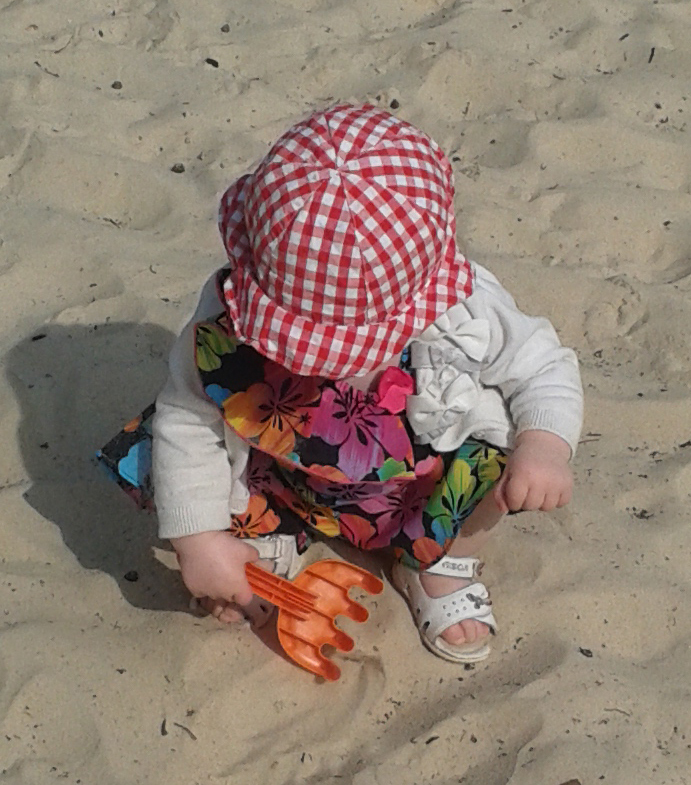 I did wonder, having never been there with the Baberoo before, how it would rate on the baby-friendliness scale. Of course, since we were there for only 36 hours, this review isn’t exhaustive ( I’d need a whole New York Mommy blog for that!) but we did discover some things about the city – or Manhattan, to be exact, since we didn’t have time to visit the other boroughs – that may be useful to parents travelling in from out of town. First things first: transportation. We were travelling with our fold-up umbrella stroller (the Uppababy G-Luxe), which is a very light and fairly small. 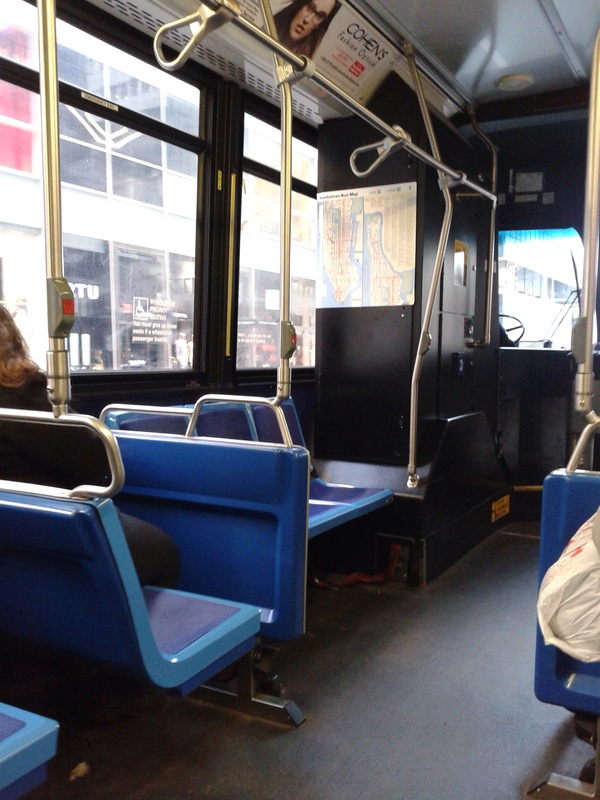 After doing some research on the MTA (Metropolitan Transportation Authority) site, I figured using the bus seemed like a good option, and being so familiar with the buses in Oxford I figured it would be a similar experience. Not so. Apparently you need to fold up your stroller when you board a New York bus, which to me cancels out the convenience of not having to go underground and contend with subway stairs. The bus did get us places fairly quickly, although that was probably because it was early Saturday morning and there wasn’t much traffic. It’s also good for sightseeing – on our ride up Madison Avenue from Midtown to Harlem we saw lots of great New York buildings. But if you’re carrying lots of bags or by yourself with a stroller you have to collapse when you board, the bus can be tricky. Since we had to fold the stroller on the bus, we figured we would try the subway the next time we were going out. 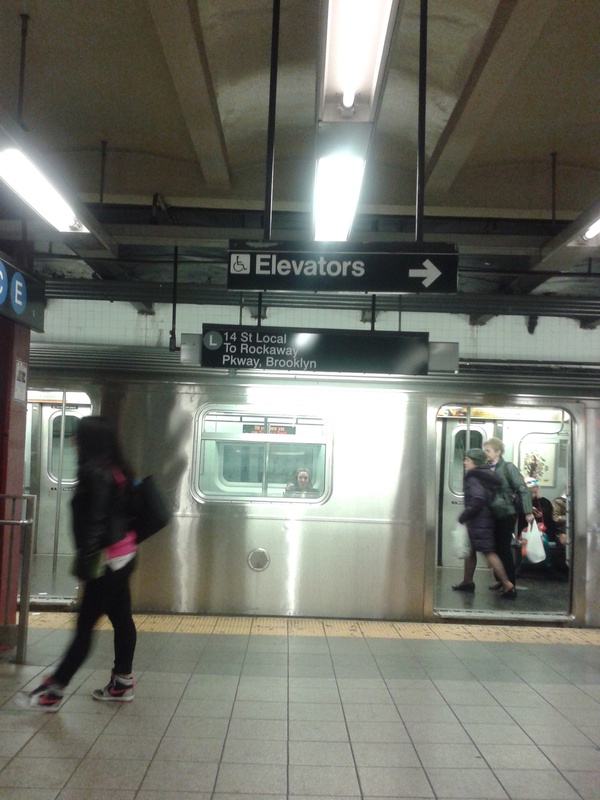 Not too many stations are equipped with elevators giving access to the platforms, but our hotel was near Grand Central Station, which is wheelchair accessible, as was our destination station. In theory that meant we didn’t have to fold up the stroller and take the Baberoo out. However, it’s not easy to actually locate the elevators that bring you down to platform level, and at our connecting station we absolutely could not find an elevator to get us off the platform, and we had to fold up the stroller and carry the Baberoo up the stairs. We then found the (very grotty) elevator down to our connecting train’s platform, but had to wait several minutes in a queue of strollers. Basically, the speed of a subway ride is compromised by the amount of time it takes to locate and wait for the elevator, so a trip that would have taken 20 minutes at most took us at least 45. Having tried the bus and the subway and having found both lacking in baby-friendliness, we bit the bullet and on our next trip we hailed a cab. Or rather, a very savvy New Yorker cousin of ours hailed it for us, and managed to snag it despite the fancy young woman in polka-dot skinnies and Louboutins also trying to flag it down (sorry, lady). The cab turned out to be a great option. It got us back to our hotel fast, and it was easy enough to pre-fold the stroller on the sidewalk before hailing the cab so the we didn’t have to do it on the fly while also trying to load bags and baby in. The Baberoo loved sitting on her daddy’s lap for the ride, and it took us right to the door of our hotel. 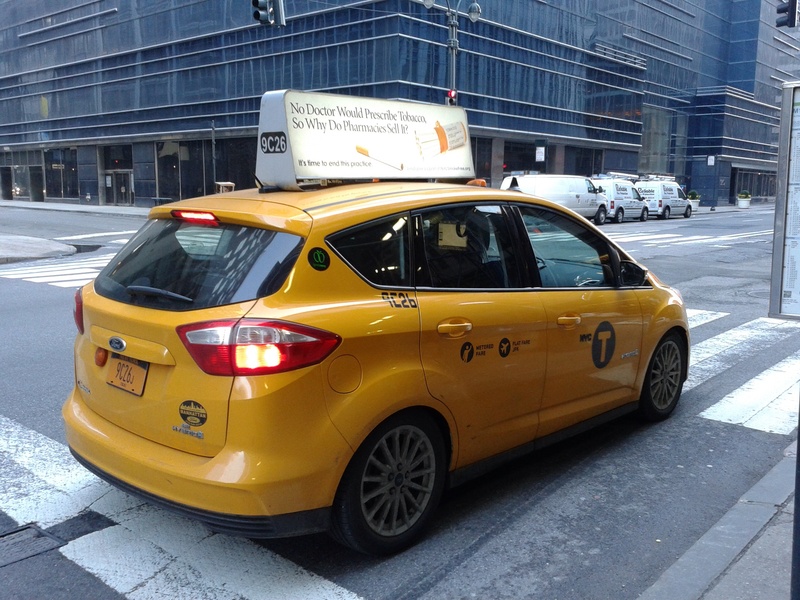 No wonder so many New Yorkers are standing out in the street trying to get cabs. They really top the buses and the subway. But of course, they add a cost to your trip – our average cost was $16 per ride and we did it four times, so there goes half a week’s grocery money. The other option, of course, is to walk. We really enjoyed a 45-block walk from Harlem to the Upper East Side, going through parts of Central Park (although we had to go back to the sidewalk when it got too hilly). We also walked through Greenwich Village and Soho, and hoofed it to the bus station on our way out of the city. Some streets can be extremely crowded and annoying, so it helps to know which routes to take and some alternatives. (Tip: never try walking down 42nd Street in a hurry.) On the Upper East Side, in very chichi residential areas, we saw what seemed like hundreds of parents walking with their babies in strollers, and at least half of those strollers were Uppababy Vistas – which is the kind we have at home. The Vista is as big as a tank and can’t be folded up very easily, so I wondered how those parents travelled around the city. We came to the conclusion that people have more than one stroller – a big one for walks closer to home, and a fold-up one that they can bring on public transport. (In fact, we were approached on the street by a guy who wanted our opinion on a new stroller he was inventing that could roll down stairs! Only in New York!) Or maybe they drive cars. Or maybe they wear the baby in a carrier when they’re on the bus or subway. In any case, walking is a great option as long as you know your route and an alternative route, and the baby isn’t in dire need of food or a change. Speaking of diaper changes: that was the most baby-unfriendly part of our experience. There is almost nowhere to change a baby’s diaper. Even restaurants don’t necessarily have baby-changing facilities. We were lucky that we managed not to have to do any baby-changing in public restrooms, but that was because I scheduled in some nap times back at the hotel, and we also visited friends with a baby (it was a super-fun play date!) so we were able to change the Baberoo at their house. 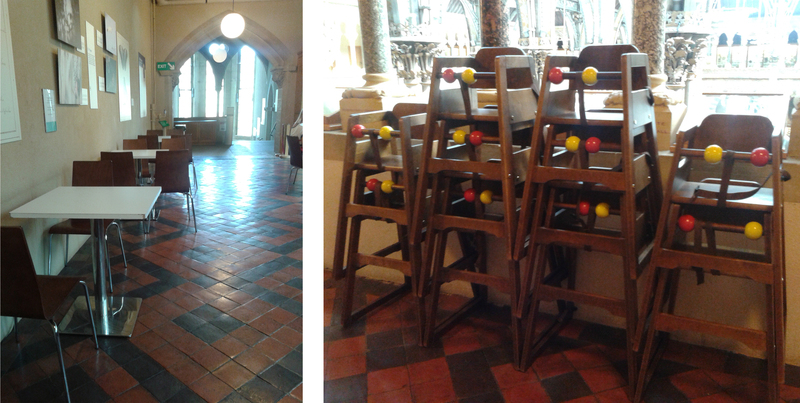 None of the restaurants we went to or cafés we visited had baby-changing facilities. It makes you wonder where anyone changes their baby’s diaper. Does everyone with a child under 3 have to go home every time their kid poops? The next place we ate out, again for brunch, was Eastwood, on the Lower East Side, with some friends who are in the know about the best new places to eat. 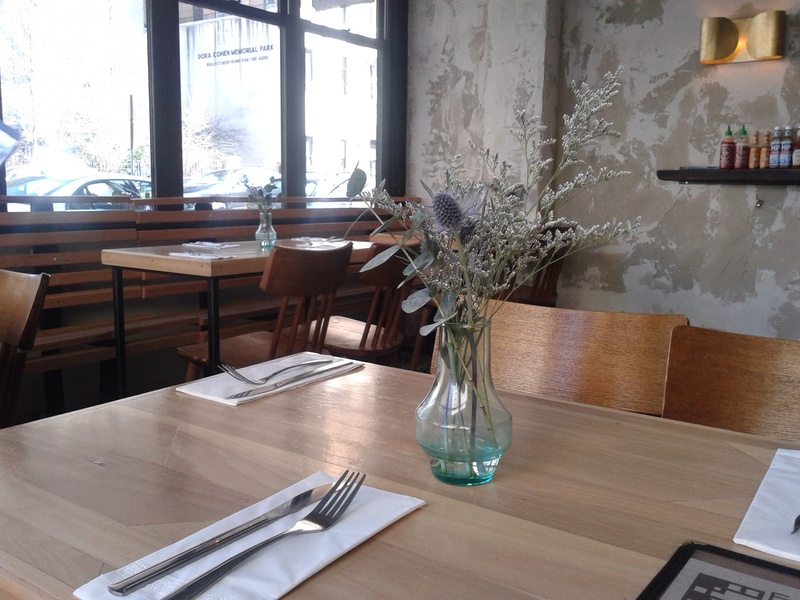 It has a lovely vibe and a fabulous Scottish-Israeli menu. My fish tacos were great and the Baberoo enjoyed her scrambled eggs. 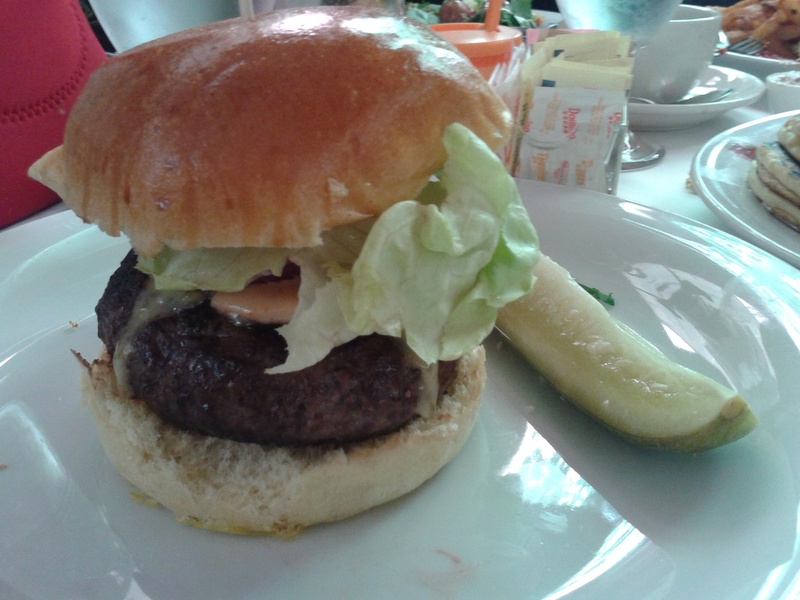 Service was fantastic and really quick, which is always useful when you have a hungry little one clamouring for food. There were no high chairs so she had to sit on my lap, but there was a lot of floor space for the stroller, which she started snoozing in as soon as she finished her meal. I would definitely go back to Eastwood to try some of their other delicious-sounding fare. We found some fun things for the Baberoo to do while we were visiting the city; one was a simple but really enjoyable trip to the park for a swing ride. There are lots of public parks in New York – the one we visited was Seward Park on the Lower East Side – and the ones we saw were pretty well kept up and quite clean. And only in a New York park can you also spot a contingent of older ladies doing outdoor aerobics to Chinese music. We also visited a great bookstore, McNally Jackson. 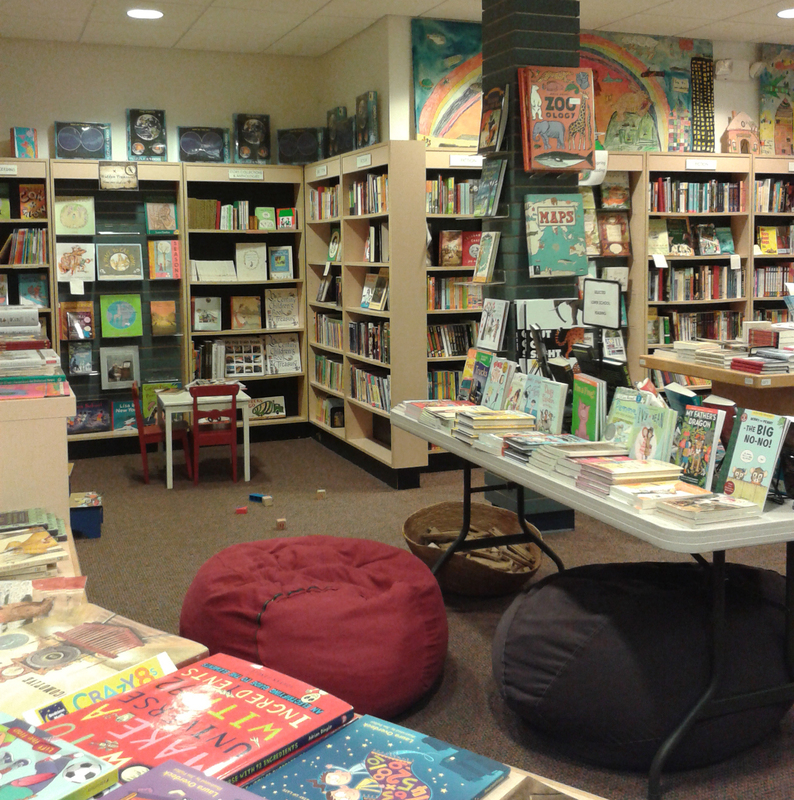 They have a fantastic children’s section, with a toy theatre kids can play in, and a great selection of old and new classics. The children’s section is in the basement so you do have to fold up your stroller to get down there, but it’s worth it. As for where to stay in New York: there are many hotels, from reasonably-priced to over-the-top expensive, but since we only stayed in one of them all I can’t tell you what others might be like. 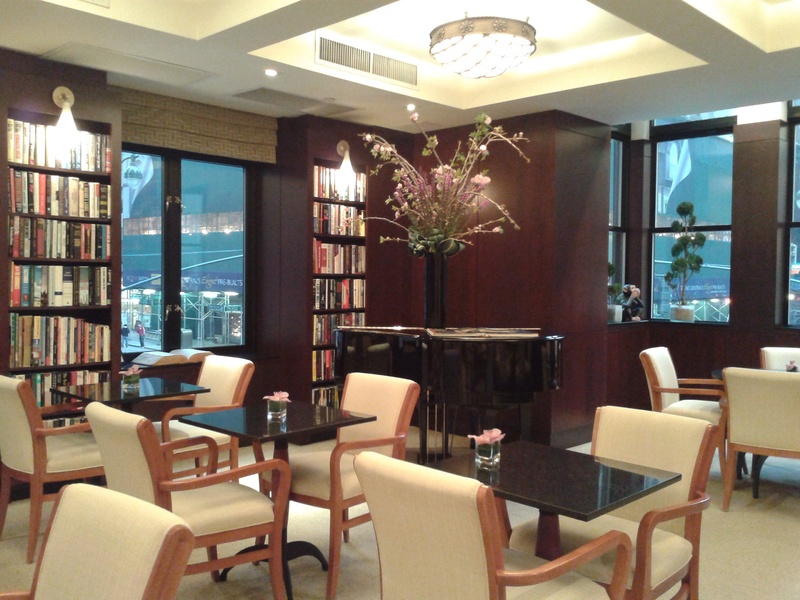 But I can highly recommend the one we chose – the Library Hotel in Midtown. 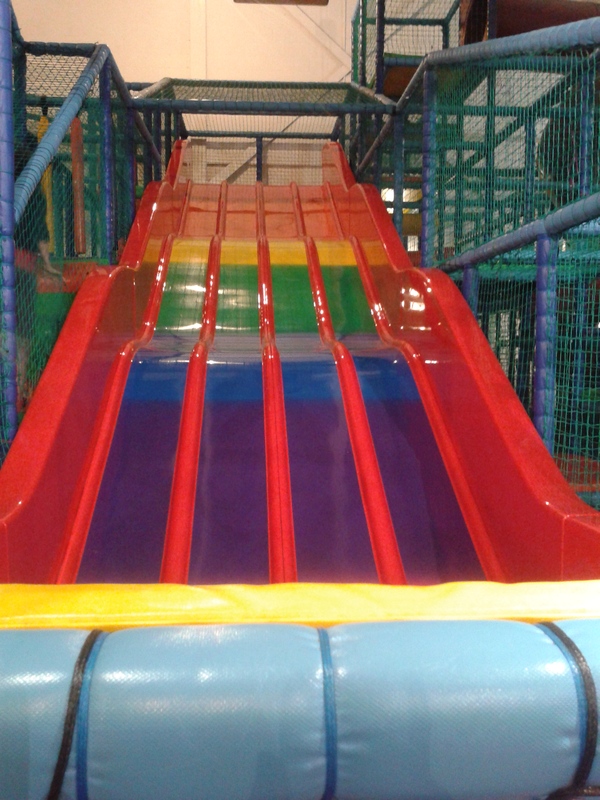 It was excellent in every respect and it went beyond my expectations for baby-friendliness. They provided a very good travel crib, there was ample space in the room to create a baby-changing station, and they had high chairs and great service in the breakfast room, which also served as a 24-hour Reading Room and quiet space (the Library Hotel’s rooms are based on the Dewey Decimal System, each room having a different subject; our bedroom was the Classic Literature room). The hotel’s public bathrooms didn’t have any changing facilities so after we checked out of our room and then suddenly needed to do a diaper change we were a little stuck – but then the staff recommended that we use one of the benches up in their rooftop Poetry Garden, which worked out just fine and was probably the best view the Baberoo will ever have while getting her diaper changed. The Library Hotel isn’t cheap, but it was our anniversary weekend and I decided to splurge, and was it ever worth it. Our trip to New York was over in a flash, but we still managed to cram in a whole bunch of activities and it was a lovely stay. It’s not the most baby-friendly city in terms of baby-changing facilities and transportation (and now I understand why lots of Manhattanites move to Brooklyn when they have kids), but boy, do New Yorkers know how to compliment babies. If you’re travelling there, I recommend using cabs for convenience and factoring the cost into your budget. Having a great, well-located hotel helps too. I can hardly wait to go back when the Baberoo is out of diapers; I suspect that will be loads easier and she’ll be able to appreciate more of the great things about the city. Yesterday was day 19 of illness in the Oxford Mommy household. Two back-to-back colds have caused us to cancel all our classes, playdates, and outings for the last couple of weeks and we were going stir-crazy. So I was racking my brains for somewhere to take the Baberoo where she wouldn’t touch things that other babies would then touch and get sick, because I would never want to inflict this cold on anyone else. All of a sudden I had an epiphany: a fun place where you don’t touch stuff? A museum, of course! So we set out for the Pitt Rivers Museum (South Parks Road, OX1 3PP, admission free) where I figured that I would get a little boost from looking at the shrunken heads and realizing that I still don’t look that bad, even after two and a half weeks of no sleep. 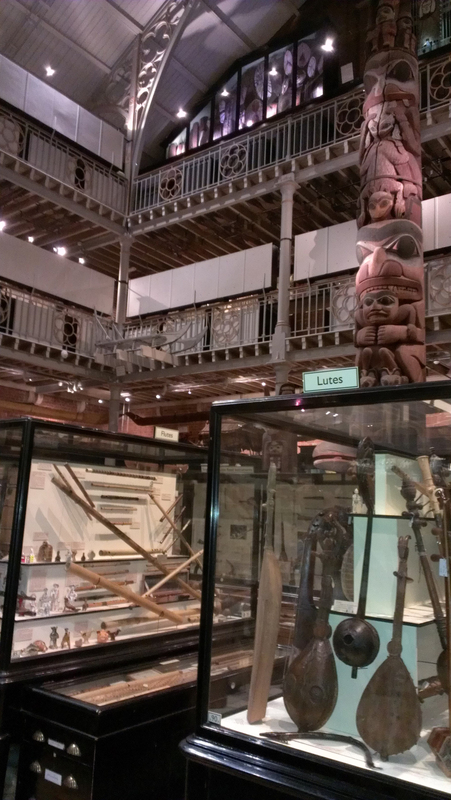 The Pitt Rivers is a worldwide anthropological collection, with objects displayed by type rather than by culture or age. Whether you’re interested in musical instruments, boomerangs, clothing, body art, spears, or toys, or just coming to browse through the myriad objects and traditions that the museum houses, you’ll always discover something interesting and unusual. 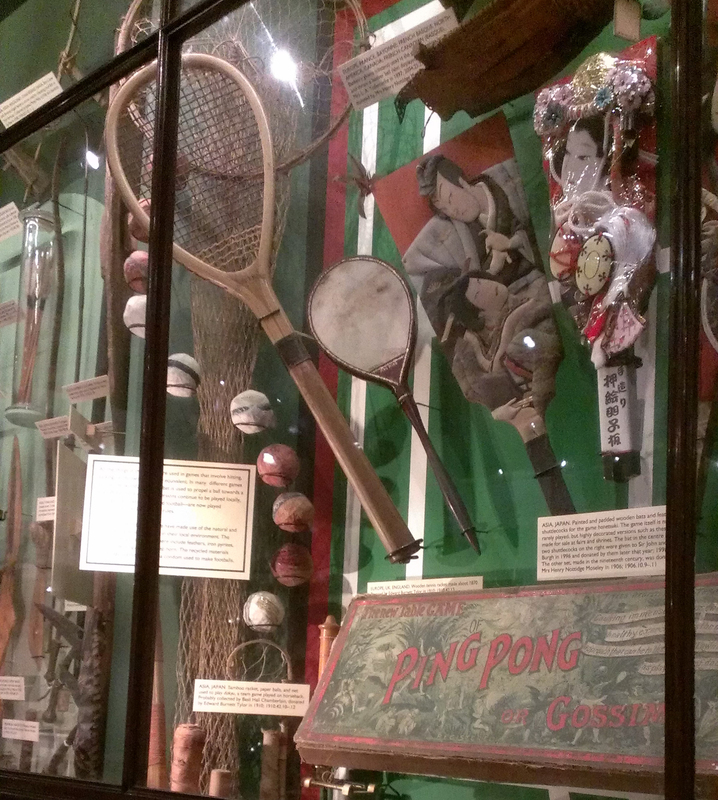 The old-style exhibition cases with their tiny handwritten labels give the museum a dark, enchanting atmosphere. But it’s not musty or boring, and during our visit there was a group of schoolchildren on a booked education session who were really enjoying vivid storytelling by a staff member. The Baberoo, being a little cranky because of her cold, was not terribly impressed by the collections, but I enjoyed looking at them, especially the textiles and the ‘ball games’ case. I was also pleased to note, after inspecting the ‘Treatment of the Dead’ case, that I did indeed still look better than a shrunken head. (We’ll have to see if that still applies in a week or so if we’re still not sleeping at night, though.) 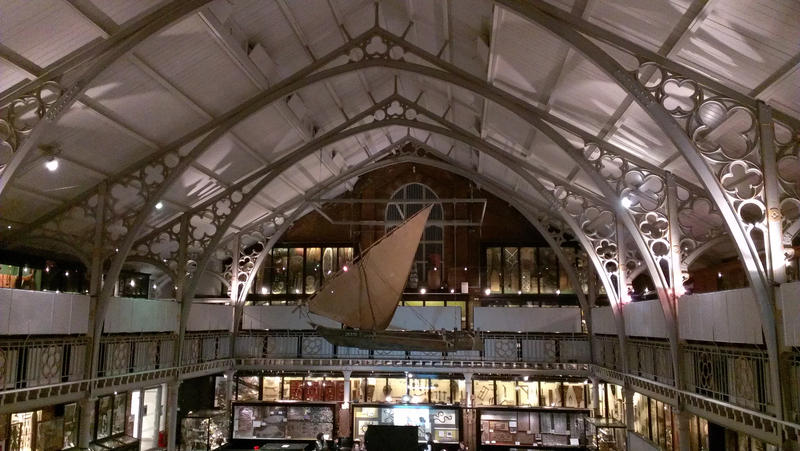 I do think that the Pitt Rivers collections appeal to older children rather than babies, so if you choose this museum as a destination it’ll mainly be for yourself. Once your kid gets to the age where they can ask all sorts of questions, it’ll be a great place for them too. 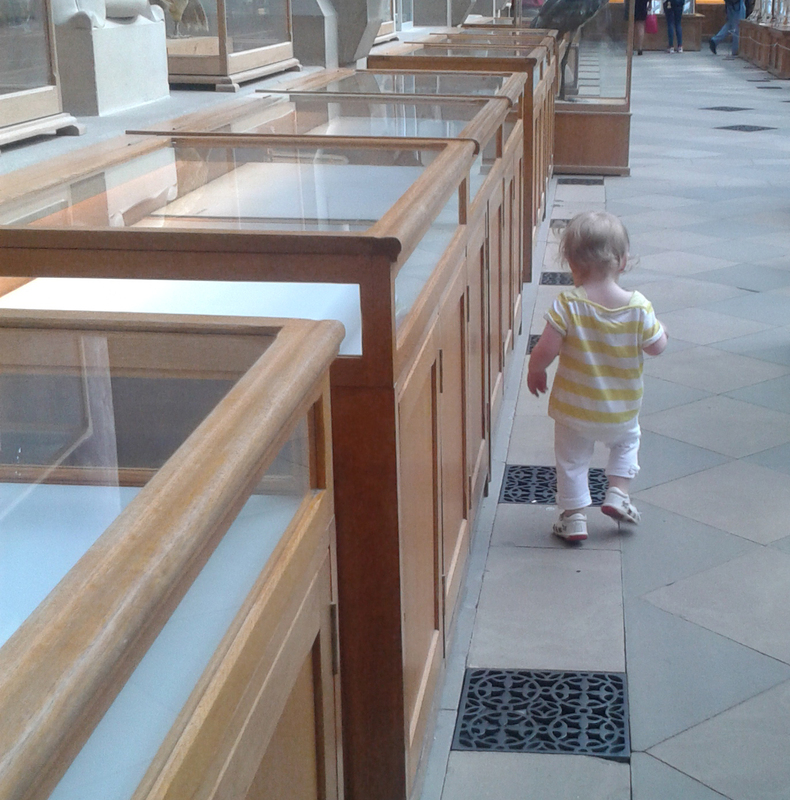 So how does the Pitt Rivers rate for baby-friendliness? I’m rating it on my ‘attractions’ scale of 8 points, 2 each for space, ambiance, facilities, and feeding. For more about my ratings system, see my About page. Space: The building the Pitt Rivers shares with the currently-closed Museum of Natural History (reopening in 2014) is an old-style Victorian building and has lots of stairs at the front, so there’s a special entrance at the side for prams and wheelchairs. The signage was good until I got to where I thought I was supposed to go in, and then I was stymied until a staff member helped me. 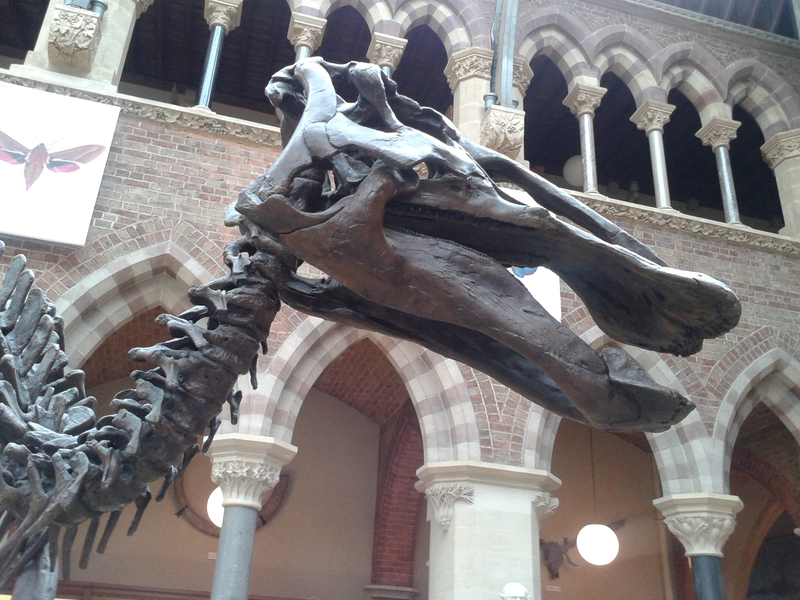 Once inside, there’s a route to follow to get to a lift, which will bring you to the main floor of the Museum of Natural History, which you walk through until you get to the Pitt Rivers. 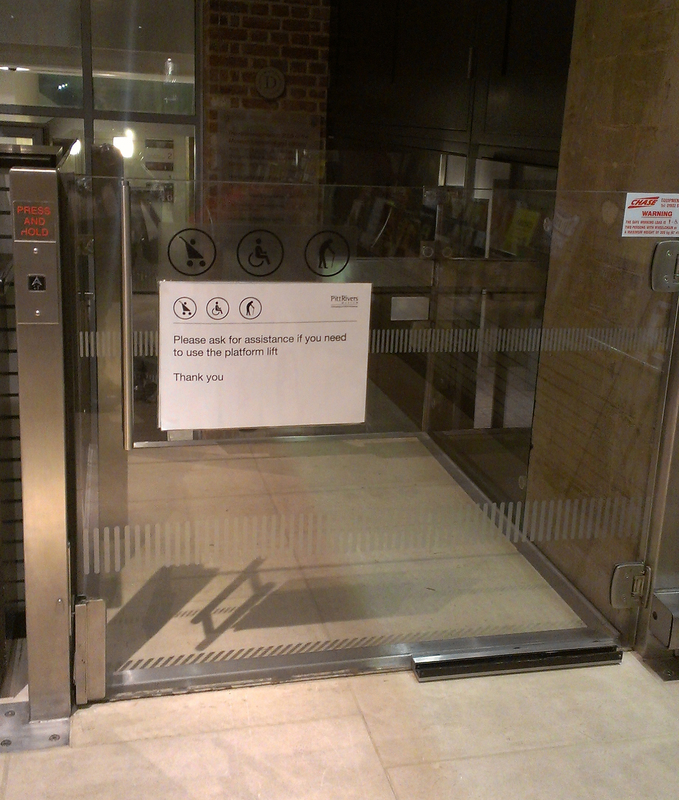 The entrance to the Pitt Rivers is its gift shop, and there’s a platform lift to get to the main court area from there. There’s another (very large) lift that will take you from the court level to the two gallery levels. With all the cases in the court area, you might think there wasn’t enough room to push a baby carriage around, but actually there was plenty of space to get through, even with our very large Uppababy Vista. It was fun to go around corners and be surprised by the contents of the next case, and I never ran into any areas where I couldn’t get through. 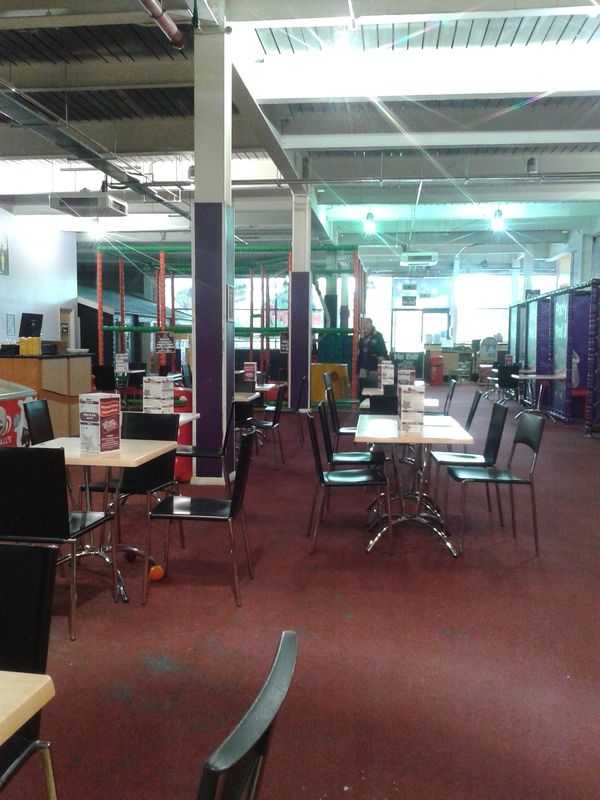 Ambiance: Staff were extremely friendly and helpful, which made up for the bad signage at the front. The museum is quite dark and pretty quiet, so it may be a good bet if you want a sleeping baby to stay asleep (unless there’s a school activity going on, in which case you can hear it throughout the space). I also personally appreciate the feeling of being surrounded by things made of natural materials that have taken time, skill, and attention to craft – it’s the kind of atmosphere that can soothe my most uneasy, illness-induced addled-brain feelings. Facilities: There is a baby-changing area on the court gallery level. It is very pretty. But whoever designed it didn’t think about needing to bring a pushchair in with you, so it is the narrowest possible space. We certainly couldn’t navigate it with our large pushchair and I doubt even the smallest umbrella stroller could make it into the space along with a parent and still have enough room for the door to close. It’s a shame, because it’s a nice-looking room and you can tell the designer tried to maximize the space by putting the changing table directly above the sink. However, you are in luck because there’s another baby-changing room elsewhere in the museum, and it’s huge. You need to go back out via the same route you came in, through the Museum of Natural History and down in the lift to the corridor leading to the wheelchair/pram exit. 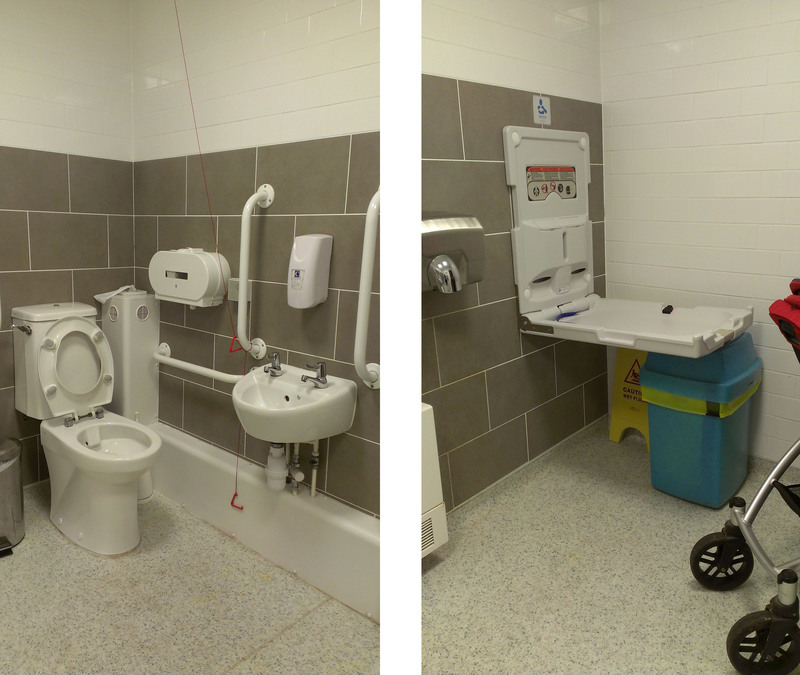 In that corridor there is a massive disabled/baby change toilet which has all the space you need. Feeding: I didn’t feed the Baberoo while we were at the museum, and of course actual food and drink wouldn’t be permitted inside the museum building. As for breastfeeding, I’ve been happy to do so in many other museums, although there aren’t too many seats available at the Pitt Rivers. 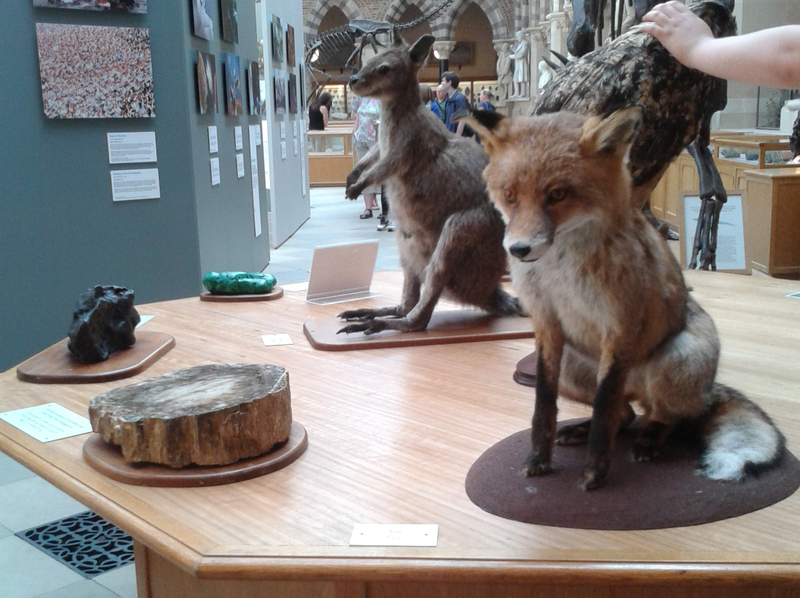 The only ones I saw were within the court gallery, right amongst the display cases. 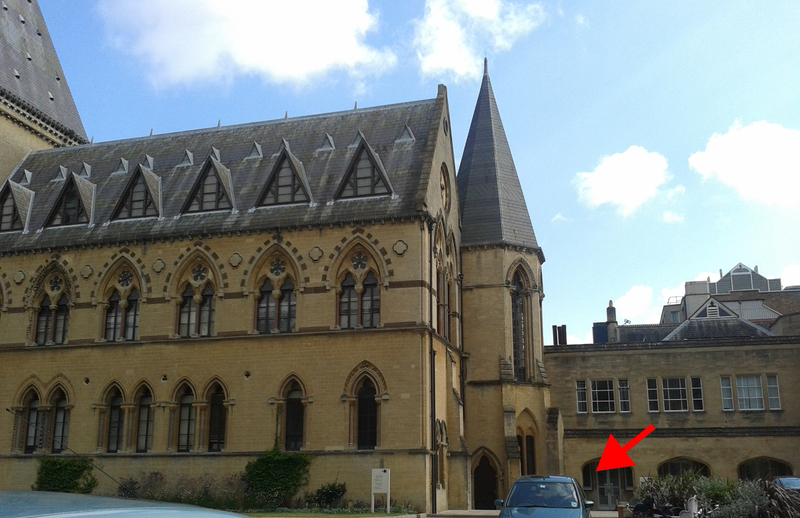 I don’t think there were any in the non-gallery areas (ie, the corridors, near the lifts, etc), but I did see someone sitting on a bench in the area outside the Pitt Rivers entrance (in the under-construction Museum of Natural History). Your choices are limited for sure, and I would probably go elsewhere for a feed. 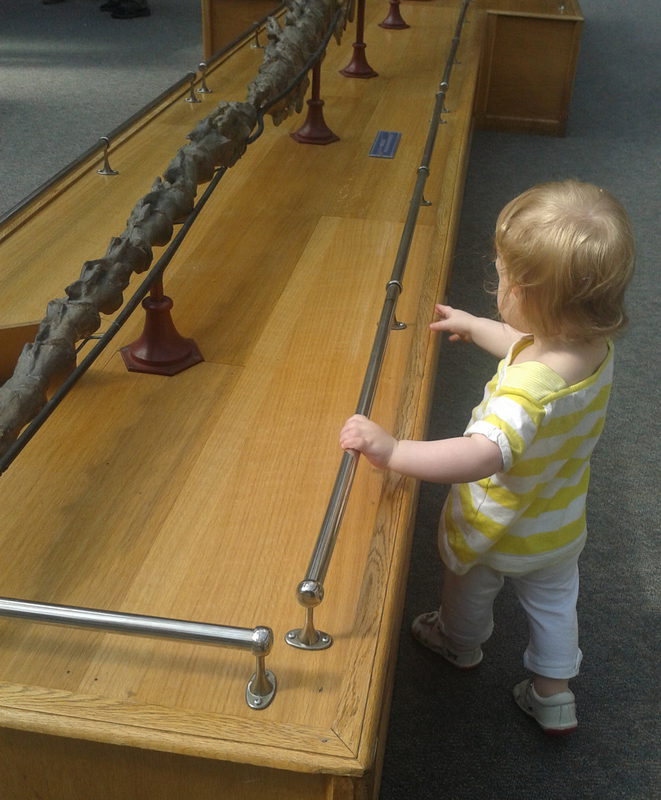 The Pitt Rivers Museum gets a 5.75 out of 8 on my baby-friendliness scale. It’s a nice place to go for a quiet and extremely interesting afternoon away from the bright lights and big crowds of central Oxford – not only during this pre-Christmas rush season, but at any time of the year.